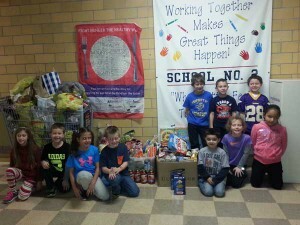 The Pre-K through second graders of School 2 in Little Falls are doing an amazing job collecting healthy foods for two food pantries: St. Agnes Church and First Reformed Church, both in Little Falls. Our school’s Media Advisor, Ms. Roth, has been reading to our students from the list of children’s book that’s in the Fight Hunger the Healthy Way toolkit. Each week our 300 students are given a choice of what food items they want to donate. St. Agnes has family pick-up days on the first and third Saturday of the month, so the Friday before we focus on collecting fresh fruits and vegetables. Our families have been encouraged to visit the 46 Farmers Market in Totowa, where the prices are more affordable than a supermarket. The school’s principal, Mr. Ryan, thought the kids would enjoy pushing around a shopping cart while collecting food. He was right! Robyn Davis has been a huge asset in planning and was also nice enough to pick up the Shop Rite shopping cart. Our PTA also put a collection box at their meeting to collect toiletries for the pantries. My husband’s office, Upper Montclair Dental Associates, has received donations of toothbrushes and toothpaste. And our Dental Hygienist, Lori Garrison, donated her own children’s “gently used” books, which were given to the pantries and distributed with food bags. Education and nutritional food are essential not only for living, but for learning. This is such a great cause, and it is heartwarming to see our school, families and especially our students give so much. I especially want to thank Mr. Ryan, who has been so open to our ideas and is such a believer in helping our community. Pat Keating, the manager of St. Agnes Church, is also willing to come present our students with a certificate of appreciation! The amount of food we have collected has been overwhelming. We are fortunate to live in a wonderful community, and for my husband to work in an amazing community as well!